Did you ever have one of those Mondays where you get so much done and have tons of energy? I had that day yesterday and it was an amazing way to start up the week. I accomplished more in 2 hours then I had the whole weekend. Whoo hoo! I even had some extra time to write up this post, so you’re getting 2 posts already this week and it’s only Tuesday. Bonus! Who am I? I don’t know, but I like this new me (don’t get too excited as this is not normal for me). So I cooked up some salmon last week and whenever I cook up salmon my kids ask for couscous as their side dish. Basically my kids equate salmon with couscous. Anyway, I was getting bored of the traditional couscous fare. Couscous reminds me of white rice, just plain and unassuming, so I was excited when I saw this recipe for couscous cakes in Fine Cooking magazine. 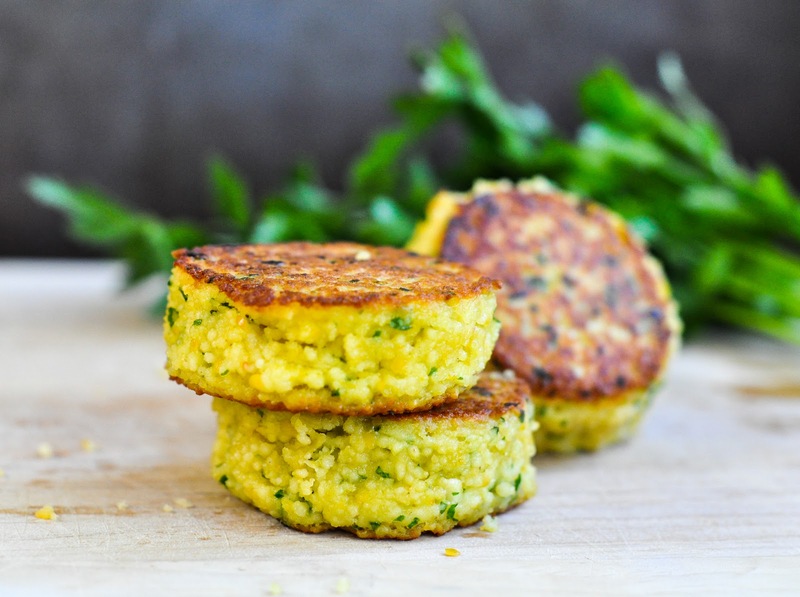 These cakes sort of reminded me of my chickpea veggie burgers. 2 large eggs, lightly beaten – I found using large eggs not extra large works best here. Coarsely chop the garlic in a food processor. Add the parsley and pulse until finely chopped. Add the chickpeas and 1 teaspoon salt and pulse until coarsely chopped. Here is what your mixture will look like after it’s been chopped. Uncover the couscous and fluff with a fork. In a large bowl, add the couscous, the chickpea mixture, eggs, and lemon zest and mix until well combined. Press the couscous mixture into a 1/4 measuring cup, smooth the top, and invert the measuring cup to release the cake onto a plate. Repeat with the remaining couscous mixture to make 8-9 cakes. I always throw my mixture in the fridge for a bit before I make the couscous cakes, so the mixture can gel together. Note: To make these a make-ahead meal, you can refrigerate the patties ahead of time and sauté them up right before dinner. You can also refrigerate the mixture as is, and make the patties right before you sauté them. Either way works. Heat 1 1/2 tablespoons oil in a large skillet over medium heat until shimmering. Add 5 of the couscous cakes to the skillet and then use a spatula to lightly flatten the cakes so they’re about 3/4 inch thick. Just take a spatula and gently press down on the cakes once they’re in the skillet to flatten them. 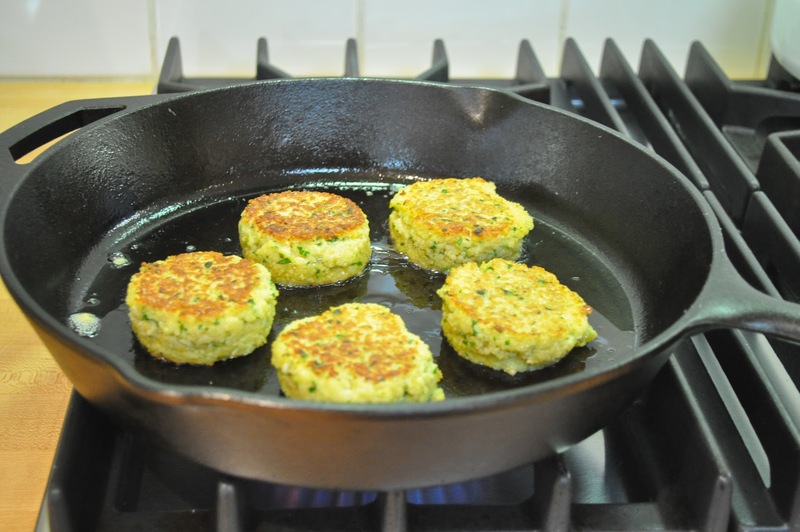 Cook, flipping once, until the patties are crisp and golden brown on both sides. The recipe said 2 to 3 minutes per side, but mine took a bit longer, like 5 minutes per side. Just make sure to cook them till they are golden brown on each side. Transfer the cooked patties to a paper-towel lined plate. Add the remaining 1 1/2 tablespoons olive oil to the skillet and cook the remaining cakes the same way. You can serve these up with just about anything. I gave the kids a couscous cake and some broccoli along with their salmon. John and I paired one with a spinach salad and some salmon. I also love serving these alongside a soup, such as my cauliflower soup. These would even be great topped with my tzatziki yogurt sauce as a lunch-time entree. Feel free to jazz these up anyway you choose. I could see adding some red or green onions to them as well as possibly substituting cilantro for the parsley leaves. 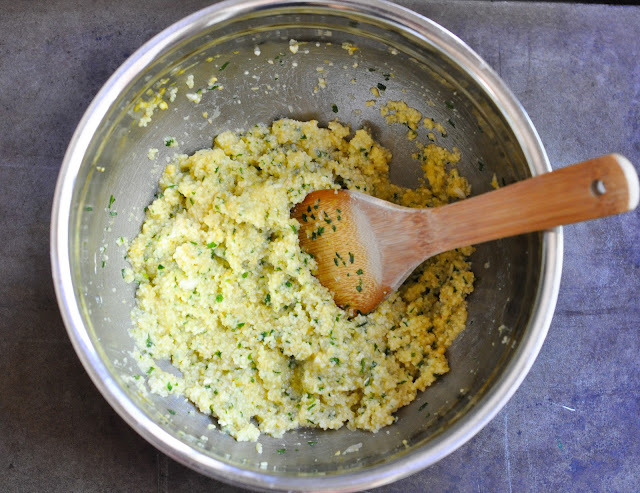 This is a great and basic couscous cake recipe. Family verdict? These were rated a 10 in my house and I will definitely be making them again! Got leftovers? Just throw them in a 250 degree oven to warm them up. 2 large eggs, lightly beaten - I found using large eggs not extra large works best here. 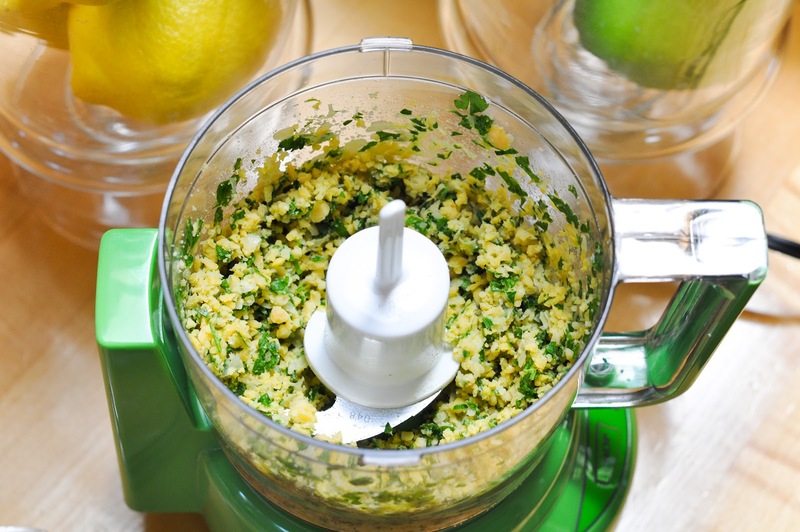 Coarsely chop the garlic in a food processor. 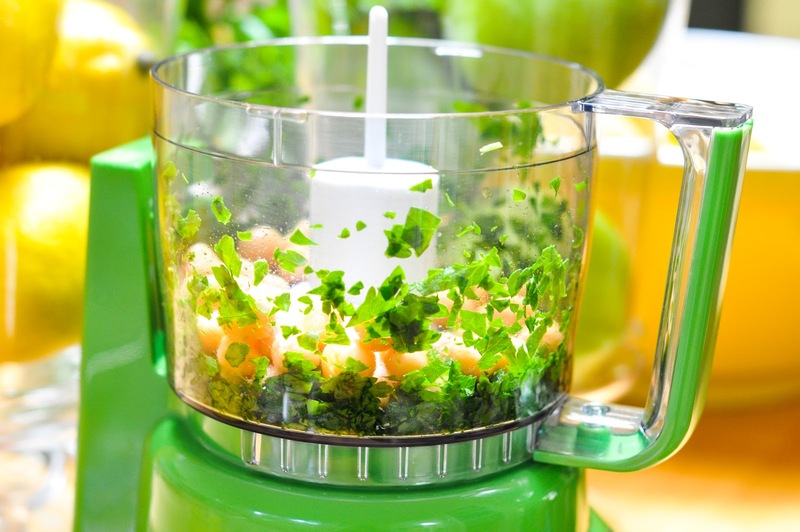 Add the parsley and pulse until finely chopped. Add the chickpeas and 1 teaspoon salt and pulse until coarsely chopped. 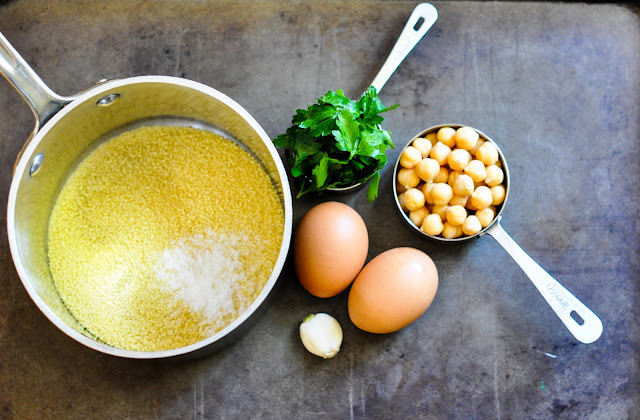 In a large bowl, add the couscous, the chickpea mixture, eggs, and lemon zest and mix until well combined. 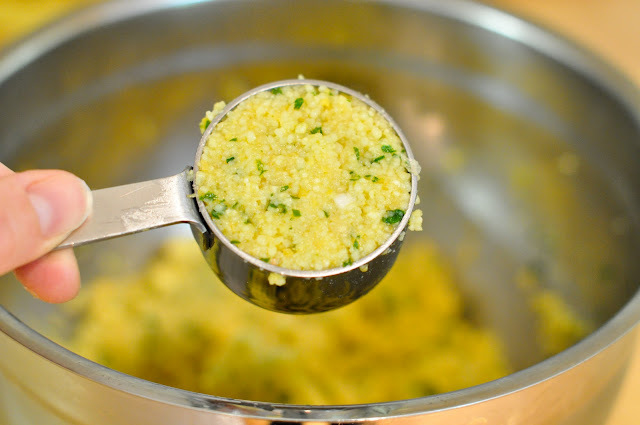 Press the couscous mixture into a ¼ measuring cup, smooth the top, and invert the measuring cup to release the cake onto a plate. Repeat with the remaining couscous mixture to make 8-9 cakes. I always throw my mixture in the fridge for a bit before I make the couscous cakes, so the mixture can gel together. Heat 1½ tablespoons oil in a large skillet over medium heat until shimmering. 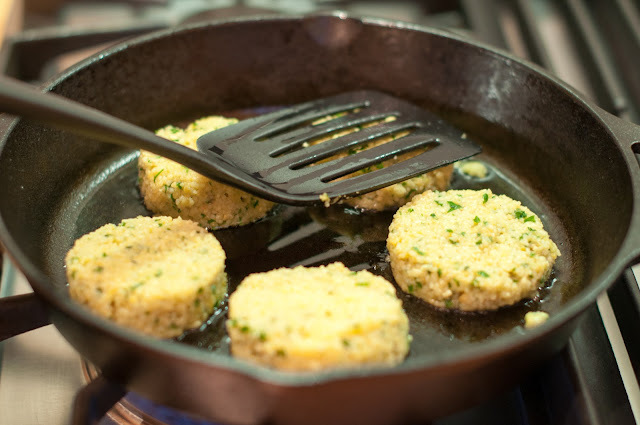 Add 5 of the couscous cakes to the skillet and then use a spatula to lightly flatten the cakes so they're about ¾ inch thick.Just take a spatula and gently press down on the cakes once they're in the skillet to flatten them. Cook, flipping once, until the patties are crisp and golden brown on both sides. The recipe said 2 to 3 minutes per side, but mine took a bit longer, like 5 minutes per side. Just make sure to cook them till they are golden brown on each side. Transfer the cooked patties to a paper-towel lined plate. Add the remaining 1½ tablespoons olive oil to the skillet and cook the remaining cakes the same way. Got leftovers? Just throw them in a 250 degree oven to warm them up. if it was ok to use spry lite then would they be free on the slimming world diet?? Can they be done in the oven please? Hi Mags. I have no idea what the slimming diet is, so I can’t answer your question about spry light, but I will tell you that you can use a healthy cooking oil like avocado oil. Avocado oil is a healthy fat, so it’s actually good for your body. I have never baked these, but you could try baking them at 350 for 30 minutes flipping halfway until both sides are browned. I would line a baking sheet with parchment paper, or use a silpat. I would also flatten the patties with the spatula (like I do in the skillet) before you put them on the oven. I would also suggest lightly brushing both sides of the cakes with some oil, so they brown up a bit. Hello! These look yummy. I am obsessed with cous cous! How long do you think these are good for after they are made? Would you refrigerate or freeze? Thank you! I made this tonight (with the cauliflower soup you previously posted) and it was very tasty! My 2 and 4 year olds didn’t like the cakes (despite generally liking all the ingredients), though the 4 year old liked dipping hers into the soup. I’ll definitely make them again as a ‘mom lunch.’ Thanks! I just made these and they are awesome!!! I was wondering if u knew how many calories ate in one cake? I have some leftover couscous. How much couscous would I use if it is already cooked? Hi, this recipe looks great! Quick question, if I wanted to make this vegan and eliminate the eggs, any suggestions on what to use or have you made sans eggs? Thanks! I made these last night and loved them so much, I blogged about them myself! Your site is beautiful, and so far, your recipes are 1 for 1. Keeup up the great work! Hi Nikki! So glad you loved them enough to blog about them 🙂 I hope you find some other recipes that you love as well. 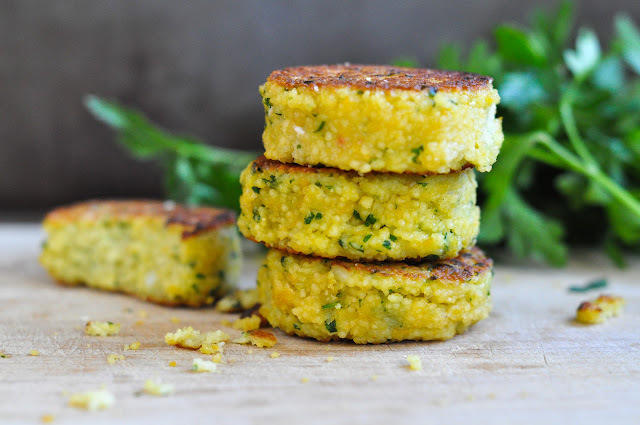 Try the chickpea burgers, I think you might like those as well. Made a double batch tonight and served them with Romesco sauce. They were delish! Plan on making your fabulous Tatziki sauce tomorrow to serve with the leftovers. So versatile. Keep the veg recipes coming! Hey Amy! Thanks for commenting and letting me know you made and loved these. What’s this Romesco sauce? Please pass it on. Did the girls like these? I will totally keep the veggie recipes coming. I have a meat one up there today for my meat loving friends. I am trying to find meatless recipes that the kids will like as well as John and I so I don’t have to make 2 separate meals. Did you see the refried bean tacos? They are easy and kind of plain, but the kids loved them! They look so good and beautiful photos! Love these, I’m always on the lookout for a new veggie burger concept. The yogurt sauce sounds perfect for them, too. They look so cute all stacked up, I bet the kids loved ’em! Yum yum yum!! Although I always equate salmon with kale and Louis with cous cows (or rice) – perhaps we should swap families!? Have fun in Santa Cruz girl. I love it there! I am still wavering on next Thursday as that is my last full week where the kids are in school and Monday is a holiday so I will be playing catch up all week. It’s so crazy now and I still haven’t purchased my tickets to visit my mom in June! Ahhhh. I will get back to you on all the above! 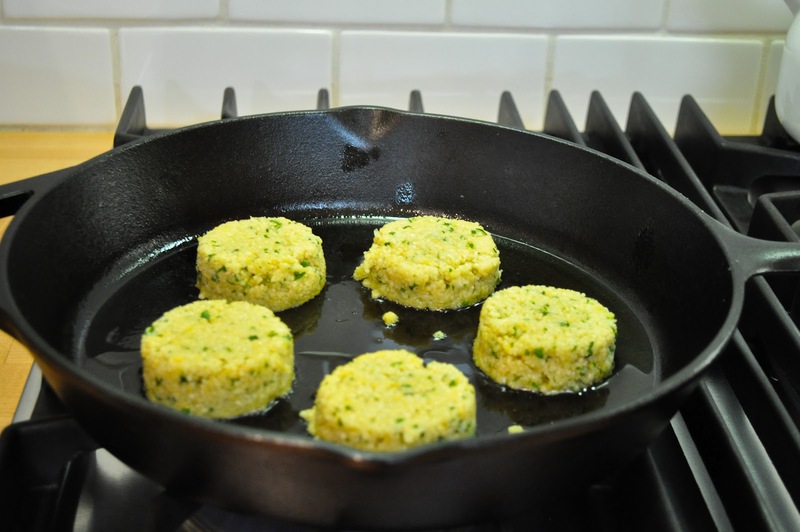 I love to make these little couscous patties. They are great too for picnics and parties! …The Aussie KA is actually different from the American KA! To be able to use the US version of KA in Australia or any Asian countries, we will need a transformer to convert the voltage of the appliance. If not, we will fry our appliance with the power surge! I thought of buying the US kind of KA initially because the US KA is more powerful than the Aussie KA but the transformer that I need to get is too BIG and ugly for my kitchen…LOL! So, I have decided to buy the Aussie one with 5 years warranty. Mine is actually an old model which I can’t find it anymore in the current range and it’s KSM 150, Metallic Silver Artisan range (tilt head) and I bought it in Apr last year. And yes…I actually have a beater attachment that has a scraper so that it can reach the bottom of the bowl but even using that, I have to stop occasionally and scrap the bottom of the bowl too. For bread making, I would strongly recommend a bread maker because it kneads really well and is temperature control and allow the bread to prove more efficiently even at wintery weather. I do use my KA for bread making but usually during warmer days. For dough that is quite tough to knead, I would prefer not to “fry” my KA and use bread maker at the safer side. Hi Zoe! Thanks for all the great information. I will definitely look into a bread machine. I had thought those were just for pre-mixed breads. oh i love making these! You are making me feel the need to get out my couscous! Delish! Wow! where is all this energy coming from and can you send a little my way?? maybe it’s the salmon – these cakes look GORGEOUS!!! so pretty and sound absolutely delicious – I’m going for these! Hi Mary! Yes, I just shot some energy light your way. Did you feel it? I know you love salmon and I think your kids would love these paired with it as well! So salt, oil and lemon zest don’t count as ingredients? How come? You wouldn’t make them without, would you?